It looks like Eurodollar is about to complete current correction. Possibly, pair may reach new minimum during Tuesday. Main target for the next several days is located near several lower fibo-levels at level of 1.3530. At H1 chart, current correction has almost reached level of 38.2%. Right now, market is trying to start new descending movement. According to analysis of temporary fibo-zones, predicted targets may be reached on Wednesday. Franc is also trying to start new movement inside main trend. During correction, I opened one more buy order. 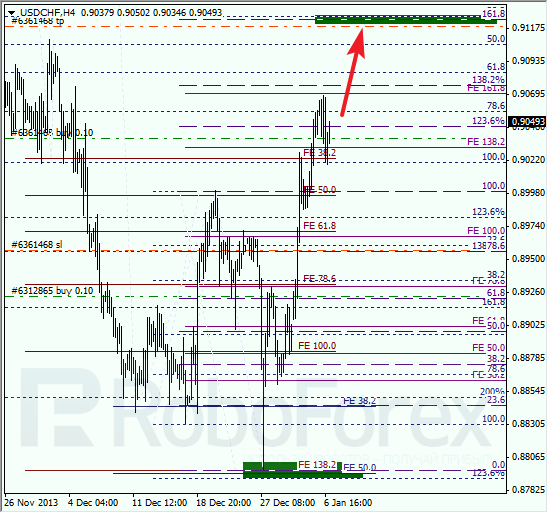 Main target for bulls is inside upper target area which is very close to level of 0.9120. At H1 chart, price couldn’t reach level of 23.6%; bulls are already trying to start new ascending movement to reach new maximums. According to analysis of temporary fibo-zones, bulls may reach upper levels by the middle of this week.